Food allergy is an adverse reaction to food that is mediated by the immune system. 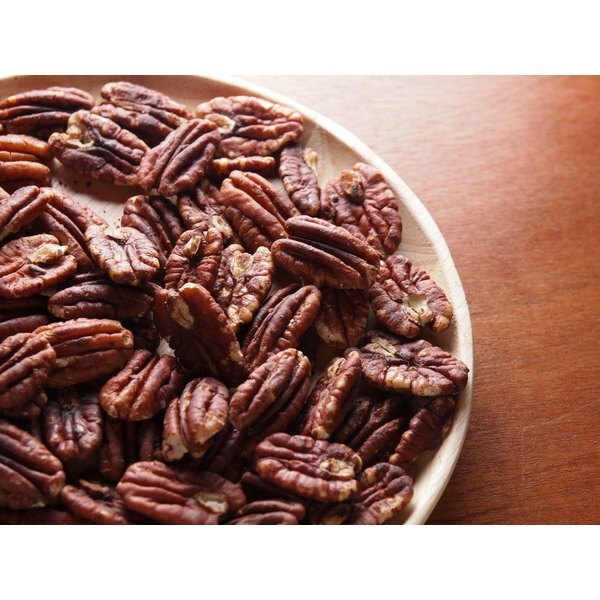 In the case of pecan allergy, the immune system reacts to the proteins in pecans and causes symptoms such as hives, vomiting, swelling of the throat, shortness of breath and dizziness that are related to the release of a chemical called histamine. As discussed by the University of Maryland Medical Center, 4 to 8 percent of children and 2 percent of adults have been diagnosed with food allergies. Food allergies affect more young children than adults, and 90 percent of these allergies are caused by eight major allergens including cow's milk, eggs, soy, peanuts, tree nuts, wheat, fish and shellfish, says UMMC. While children tend to outgrow most of these allergies, allergy to peanuts and tree nuts is less frequently outgrown and resolves in only 20 percent of patients. A family history of food allergies increases the chance that a patient will have a food allergy, though not necessarily to the same food as other family members. Symptoms of pecan allergy can range from mild to life-threatening. Symptoms typically occur within one hour of ingesting a pecan or a pecan-containing substance. Symptoms include hives, itching, swelling, nausea, vomiting, diarrhea, shortness of breath, wheezing, coughing, dizziness and loss of consciousness. Not all of these symptoms will occur in a reaction and some patients will have only skin symptoms such as hives or swelling. It is important to remember, however, that the more mild skin symptoms can progress to systemic symptoms and that a mild reaction with one exposure does not mean that the next reaction will also be mild. Diagnosis of pecan allergy can be performed in an allergist's office. First, a history will be taken to determine whether the symptoms sound consistent with an immune-mediated reaction. If the allergist feels that the symptoms likely represent an allergy, skin prick testing can be performed. Skin prick testing involves scratching the surface of the skin with the allergenic protein of the pecan and then measuring the reaction on the skin surface. Blood testing that measures the level of allergic response to the pecan protein may also be performed. While these tests are helpful in determining whether allergy exists, the size of the skin reaction is not helpful in determining how severe the symptoms related to pecan exposure will be. The most important treatment of pecan allergy symptoms is avoidance of pecan exposure. This can be difficult as pecans can be found in unexpected food sources such as vegetarian products, sauces, seasonings, pie crust, fish dishes and pasta. Additionally, it is typically advised that patients with a pecan allergy avoid all tree nuts and peanuts because of the concern for cross-contamination in the processing plant. If an accidental exposure occurs, an anti-histamine and injectable epinephrine can be used to help reverse the reaction and decrease symptoms. A patient with a pecan allergy should have this medication readily available to him and carry injectable epinephrine with him at all times. In this situation, the patient should go to the emergency department immediately even if he has improved with treatment available at home. Even though epinephrine may reverse the symptoms in short-term, some patients develop symptoms once the epinephrine wears off. Patients with pecan allergy should also wear a health-alert bracelet to ensure that information regarding the allergy is available to medical personnel in the event of an emergency.